Who knows what secrets lurk beneath even the noblest facades? We do, thanks to fiction like The Truth and Other Lies. Part of both the Bloody Knife and Spouses With Secrets genres, this tale of lies and the liars that tell them is a very juicy little read. Our main character is bestselling author Henry Hayden, who lives a quiet life with his quiet wife Martha, outside of a quiet seaside village. He has money to burn, but isn’t extraordinarily extravagant. He likes nice things, of course, but is happy with his home and his life. He has a friend or two in the village, as well as his editor and publisher at the small publishing house that had not only made him famous, but saved themselves from insolvency in the process. There’s only one problem – Henry’s life is filled to the brim with lies of every possible sort. I’m not going to tell you even a single one of them (though the book flap gives away rather too many in my opinion) because that would spoil your fun in getting to know Henry Hayden all on your own. First time novelist (but well known German screenwriter) Sascha Arango has created a character that is both vastly complex and remarkably simple, in both actions and motives. He is self-aware and has emotions both good and bad that are sometimes almost genuine. He loves his wife, he likes being famous and wealthy, and in general he does what he pleases and deals with any consequences later. To him, it’s no big deal, most of the time. For us, it’s fascinating web of delusion, deception, and sociopathology. 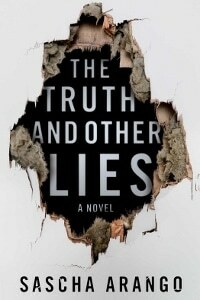 The Truth and Other Lies is well paced and beautifully characterized. We may or may not like those characters, but they are oh, so very interesting. Arango spins his tale with finesse, revealing only as much of the truth as we need to keep us turning the page, wanting to know how and when and why and who and most of all…what if. There are enough variables out of Henry’s control that it’s a fun ride to see where exactly he will come out in the end. Overall, I truly enjoyed The Truth and Other Lies. Well written, plotted and characterized, it’s an excellent debut novel from Sascha Arango, who I will definitely be keeping an eye out for in the future.